What role does Social Services play at Westgate Gardens Care Center? Our social service team assists both residents and their families during transitional periods. They also provide essential information, manage requests and concerns, help in the care and discharge planning for each resident. They can arrange professional services for: Dental, Vision, Podiatry, Audiology, Power of Attorney, Dementia assessment, Psychosocial and Psychiatric Evaluation, and Individual therapy. Should you wish to have Westgate Gardens Care Center wash the laundry please notify the front office upon admission. Subsequently, if a family/care giver is going to take care of the laundry at home, please let the nursing station know your plans. This way, the staff can place a sign on the closet door notifying our housekeeping staff to leave the clothing for family pick up. We request that family provide a hamper for clothes and pick it up twice a week. For the safety and welfare of all residents and staff, Westgate Gardens Care Center is a non-smoking facility. There are designated smoking areas in the outdoor areas. Cable is provided at no extra charge. Residents may bring in their own TV and our maintenance team can help get it hooked up. If you would like a TV but do not have one, we can make arrangements to get one. Residents may bring in their own cell phone or we can help with getting a landline set up with the local phone company. Westgate Gardens Care Center has a vibrant atmosphere with dynamic, individualized activities that match the capabilities and needs of residents and their guests. We also have active resident and family councils and volunteer programs. Scheduled activities include: music, fitness activities, religious meetings, outside entertainment, games, gardening, field trips/outings and volunteer involvement. If you would like to arrange something special or have suggestions and ideas for individual or group activities, please inform our activities director. We welcome and encourage involvement from family and friends. Our primary concern is that your loved one feels comfortable here at Westgate Gardens Care Center and that their needs are being met. You should feel secure and at ease with our staff, particularly those providing direct care. If you have any concerns or praise for our staff, please feel free to contact our social services department. They will be able to address any apprehensions you may have regarding any particular staff members. Westgate Gardens Care Center employs a full-time Business Office Manager for all financial and billing concerns. Should you have any questions regarding these matters please make an appointment to see our Business Office Manager by contacting the front desk/receptionist. What is the difference between a CNA, LVN, and RN? A Certified Nursing Assistant (CNA) is a health professional who works under the supervision of Registered Nurses (RN’s) and Licensed Vocational Nurses (LVN’s) to provide a wide variety of basic hands-on resident care. CNAs perform basic nursing functions such as personal care, taking vital signs, positioning residents, and ambulation. An LVN provides basic bedside nursing care to residents under the direction of a physician or registered nurse. 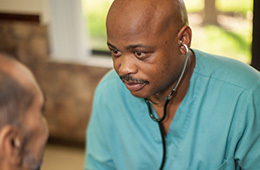 Duties within the scope of practice for an LVN typically include but are not limited to, provision of basic hygienic and nursing care; measurement of vital signs; basic client assessment; documentation; performance of prescribed medical treatments; administration of prescribed medications; and, the performance of non-medicated intravenous therapy and blood withdrawal. An RN’s duties may include everything a CNA and LVN carry out, in addition to administering an IV, assessment of residents, skin care, and processing doctors’ orders. Furthermore, RN’s typically take on management positions such as the Director of Nursing, who is responsible for all nursing duties in the building. What happens when my loved one’s stay at Westgate Gardens Care Center is over? What options do we have? Prior to discharging home, make sure to think about the environment you will be returning to. How many steps do you have to climb? Do you have the adaptive equipment to aid in bathing? Who will be providing you groceries and cooking? How will you get to doctors’ appointments or the pharmacy? Can you care for yourself independently?